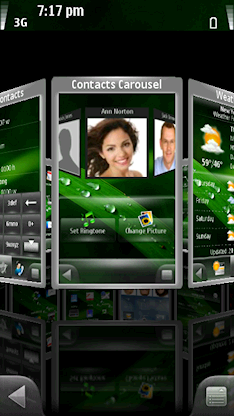 Alongside Touchflo 3D by HTC, SPB Mobile Shell has been one of the most popular user-interfaces for Windows Mobile devices for many years – and justly so. It makes Microsoft’s in many ways archaic OS more slick and up-to-date, and back in October last year, I recommended version 3.5 of the UI that had just been released. Up until now, Mobile Shell has only been available for devices powered by WinMo. A couple of months ago, however, SPB announced that the next release of Mobile Shell would bring along support for Symbian and Android devices as well, due to a “new portable SPB UI Engine”. I enjoyed that announcement and looked forward to testing Mobile Shell on Symbian 5th Edition, although I doubted that SPB would be able to bring an equal amount of functionality to each platform. For the past week or so, I’ve been able to use an advance review copy of Mobile Shell for Symbian^1 on my Nokia N97, with mixed impressions, but more on that later on. SPB Mobile Shell is a complete user-interface, and it can basically replace all the native UI elements on your Symbian^1 device. 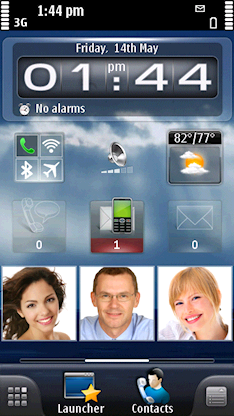 It includes two different customizable homescreens (Professional and Lifestyle layouts), 15 widgets, a weather app, a program launcher and skins. 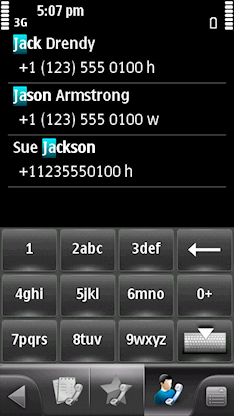 SPB’s UI also features a couple of neat ways to access your contacts: there’s a Favorite Contacts screen with photos, as well as a rotating Contacts Carousel in 3D, a call log and an intuitive T9 contacts search mode, which is great. The Lifestyle layout is on by default and it’s reminiscent of the homescreen on Android phones. You can choose to have one, three or five pages, which you can fill up with various widgets including shortcuts, a picture frame, digital and analog clocks, an agenda widget, wireless switches, notifiers, profiles, et cetera. To switch between the pages, you just slide your finger horizontally across the screen. The Professional layout works in the same manner as the Lifestyle view – it just has a another setup from the start. Even though SPB’s homescreen works fine, it pales in comparison to the Android equivalent, and it unfortunately lacks most of the things that make the Android homescreen great: it’s not as smooth, diverse, intuitive, easy to use or customizable. This is of course especially noticeable if you have a device running Google’s open-source platform yourself. 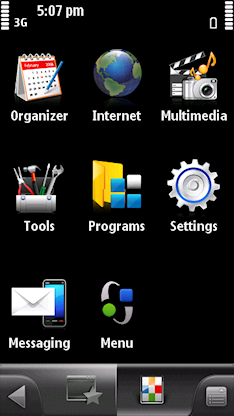 Mobile Shell 3.5 for Symbian^1 also comes with an app launcher, with program shortcuts divided in various folders. I have no use for it myself, since my main menu is already optimized; with all the icons organized into folders and located exactly where I want them. 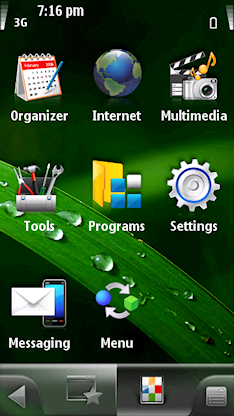 Luckily, you can simply press the hardware Menu button to bring up Symbian’s native main menu and bypass Mobile Shell’s launcher. Despite the fact that the Nokia N97 and most other Symbian^1 phones don’t have hardware accelerated 3D graphics, the effects-heavy SPB Mobile Shell generally performs well on the ol’ N97, although it doesn’t look as slick as it does on many other devices, and the scrolling is less smooth. 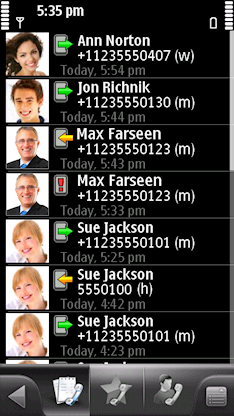 The Carousel Contacts slider in particular can be a pain to use, and the N97’s resistive screen makes matters worse. An overall feeling I get when using SPB Mobile Shell 3.5, is that the UI is bloated. It would definitely have benefited from being more streamlined. I think it’s great that SPB has started making software for platforms other than Windows Mobile, and that they have brought their popular UI to Symbian. I would however personally not use Mobile Shell on my Nokia N97. Why? 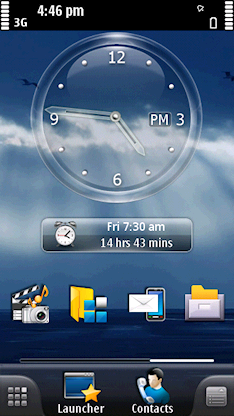 It can’t utilize any of the N97’s native homescreen widgets, and the widgets that SPB supply often have an overly glossy look that can make them look cheap. On top of that, the UI uses too much RAM (about 25% of the available free amount / ~12MB on my N97), is somewhat bloated, and last but not least – it reminds me of WinMo, and that’s generally not a good thing. The native user-interface on Symbian^1 could certainly use both a face-lift and a bit of modernization – not much has changed since 3rd Edition devices, but at least it’s quick, easy, basic, familiar and functional. 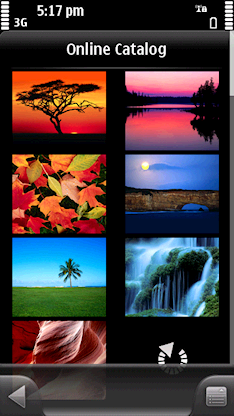 Mobile Shell nullifies a few of the things that actually make Symbian^1 pleasant to use. Perhaps I also would have enjoyed it more if I wasn’t so used to the excellence of Android. There’s a trial copy available at the official website, so don’t take my word for it and check out Mobile Shell for yourself – you may get an entirely different impression of the UI. 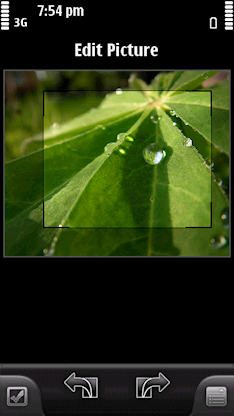 I’m sure it has the potential to make the N97 feel like a new and different device for many users.